It usually takes a lot of convincing to get me to dine anywhere west of Hollywood on a weeknight, but all it took was a straightforward invitation for me to make the trek out to Manhattan Beach Post to try Chef David LeFevre’s food. LeFevre is a former industrial engineer who honed his cooking chops under Charlie Trotter before earning a Michelin star as the executive chef at Water Grill in downtown Los Angeles. M.B. 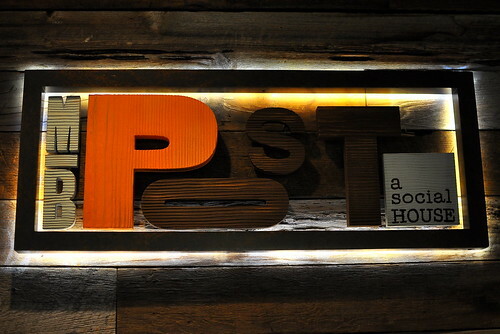 Post is his first solo venture. 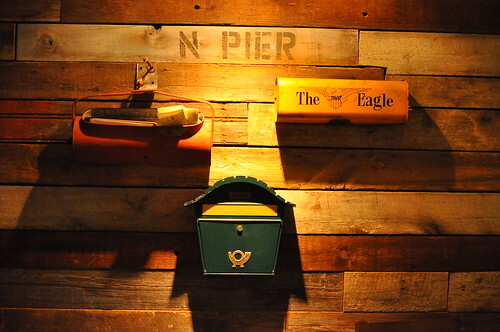 Chef LeFevre has ditched fine dining for family-style fare at his new beach-front digs. The rustic, soulful, and communal dishes coming out of the kitchen reflect the style of food that the chef personally enjoys preparing and eating. The post office theme is carried over to the menus, which are folded and dated like letters. I’m a sucker for cute little touches like these. Since I was the designated driver for the evening, I couldn’t partake in any libations. 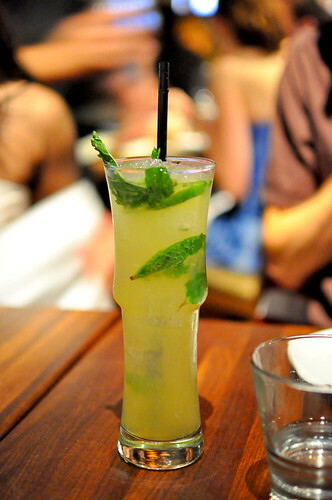 However, The Astronomer enjoyed a Mo-Pho-Jito ($12), which was a classic mojito with a Southeast Asian bent. Think: ginger and coriander. I took a little sip and desired a hit of star anise. Some of my favorite bites of the night came from the “Pass the Bread” section of the menu. 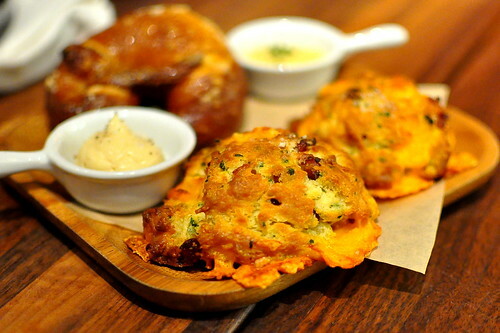 I adored the bacon cheddar buttermilk biscuits with maple butter ($4) and couldn’t get enough of the fleur de sel pretzel nuggets with horseradish mustard ($4). Both arrived hot from the oven, ready to be devoured with gusto. 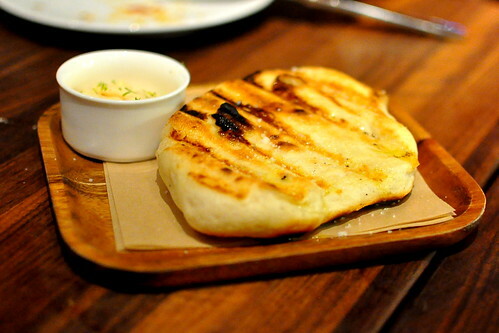 The third bread that we indulged in was the grilled cumin naan with harissa yogurt ($5). It was a milder offering than the biscuit and pretzel, but still on point and so very good. The next set of dishes came from the “Eat Your Vegetables” portion of the menu. There were a handful of virtuous items underneath this heading, but we purposely chose the ones that veered off the healthful path. 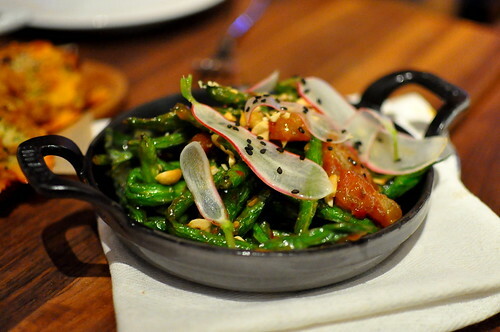 The first to arrive were the blistering green beans with Thai basil, chili sauce, and crispy pork ($8). These tasted like the classic Chinese preparation, but with a crispy pork bonus. 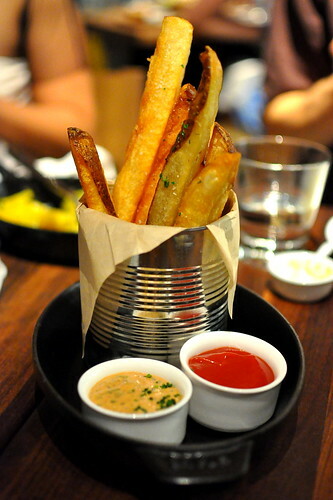 The “fee fi fo fum” fries ($6), which were served with ketchup and “fry sauce” laced with Cajun spices, were indeed humongous. Eating potato spears was a fun novelty, but they didn’t necessarily taste larger than life. 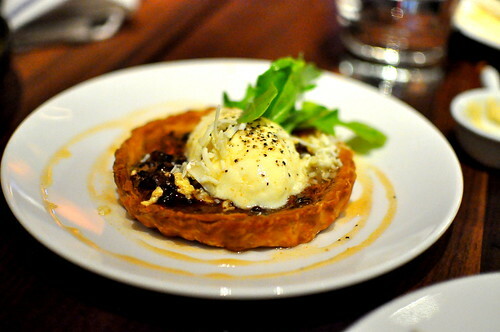 The final “vegetable” was a Spring Garlic Bacon Tart ($11) with Bellwether ricotta, spiced honey, and arugula. It’s highly doubtful that this counted as an FDA approved vegetable serving, but no matter; this savory tart was a winner in my book. 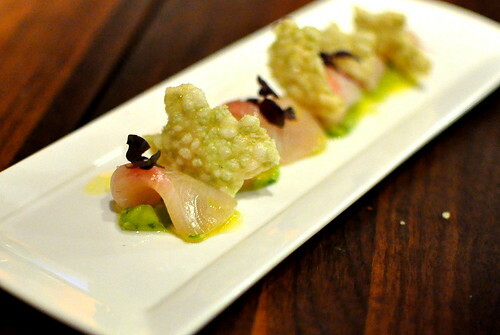 Moving on to the “Seafood…Eat Food…” section of the menu, we sampled the Kona Kampachi ($12) with yuzu, avocado, and puffed rice. This dish was noticeably lighter than the earlier items that graced our table; the twist of yuzu brightened up the entire plate. By the time the basket of Alaskan halibut cheek and chips ($12) came my way, all that was left were potato wedges and remnants of a Meyer lemon remoulade. According to my ruthless dining companions, the hunks of cheek were tender and flaky. All’s fair in love, war, and communal dining, I guess. 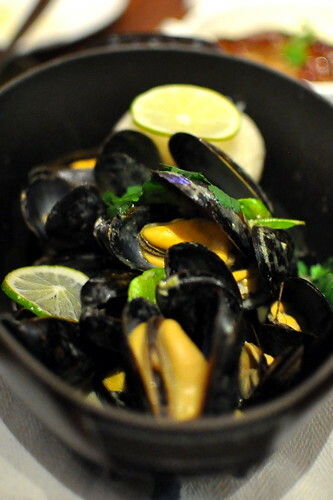 The highlight of the seafood offerings was the expertly steamed mussels with green curry and Chinese sausage ($14). To sop up the luscious broth was a mound of sticky rice. Why can’t all mussels be prepared with an Asian flare? The final savory courses were from the “Meat Me Later…;)” section of the menu. 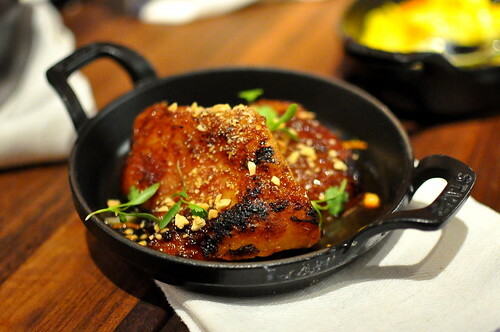 The Vietnamese caramel pork ($11) was a solid rendering of my people’s thit kho. The green papaya salad brought balance to the richness. 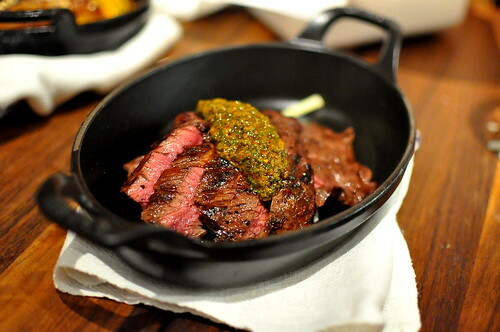 The Meyers Farm skirt steak ($16) also didn’t disappoint. The steak had a beautiful sear and each bite was perfectly juicy. On the side and on top were grilled ramps and a red chimichurri sauce. 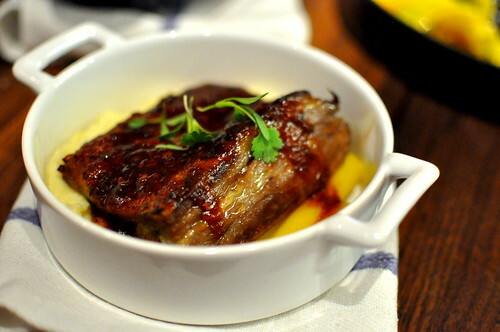 The final savory dish was the Moroccan BBQ lamb belly ($13) with creamy semolina and Weiser Farm burgundy carrots. I was just about comatose when this hit the table, but I managed to fit a hunk of belly in my belly. The meat’s texture was beyond tender, while its flavor was unabashedly gamey. 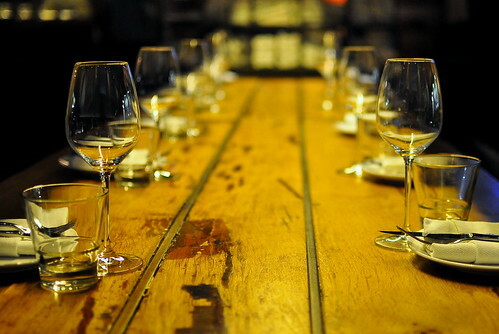 And last but not least, we sampled all three desserts under the “A Spoon Full Of Sugar…” heading. 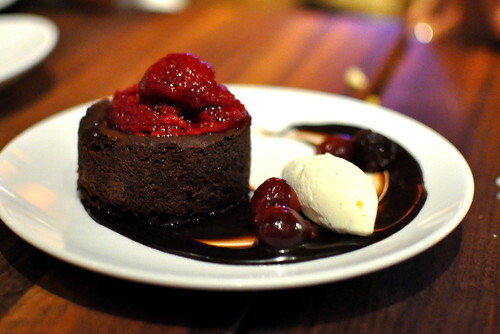 First up was the chocolate cherry pudding cake topped with a black cherry granita ($7). Candied cherries, a gooey chocolate sauce, and vanilla creme fraiche were served alongside. The only bites I could muster given my limited gastro capacity were a few plump and sweetened cherries. Yum. 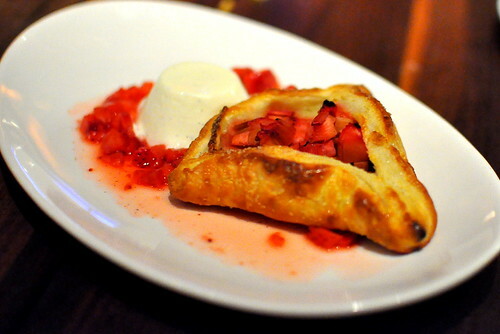 Also on deck was a three-point tart with macerated strawberries and rhubarb and buttermilk panna cotta ($6). The smooth and silky panna cotta went down nice and easy. 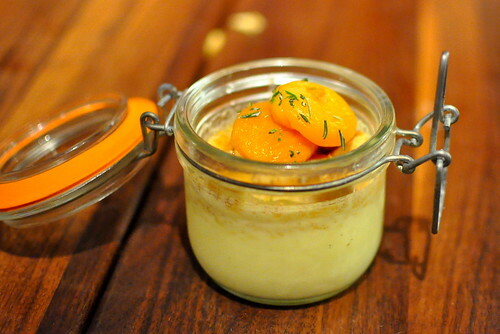 And finally, a lemon ricotta cheesecake ($5) served in a jar with stewed apricots, cornmeal streusel, and marcona almonds. This was The Astronomer’s favorite. Thirty-some-odd miles is quite a distance to travel for dinner, but the trip was more than worth my while given the stupendous feast at MB Post. I’d do it again in a heartbeat. 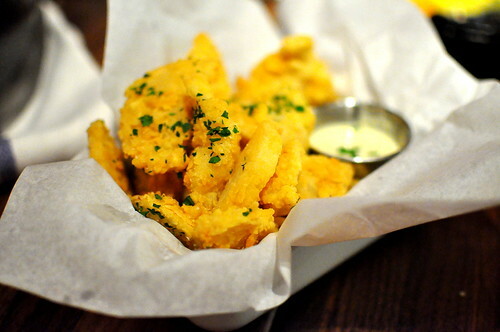 Regrets: My part in not “saving” you a piece of fried fish (my B, cc). Not eating more of the lamb belly (damn good). Not stealing the polar bear. I walked by here when I went to the Farmer’s Market one time. Your pics make it look amazing! Lien – I will think twice before I sign up to dine with you gals again 😉 By the way, I think the photo of the polar bear ought to be framed and displayed at Salty’s. Jenn – Thank you! I’m glad that my photos did the food justice. Chef LeFevre is a talent. Pingback: MB Post – Manhattan Beach – gas•tron•o•my | Play Boomtowns! ok, the food looks great, yadda yadda yadda. the i love the decor of this place. they really thought a lot about the entire ambience and feel. 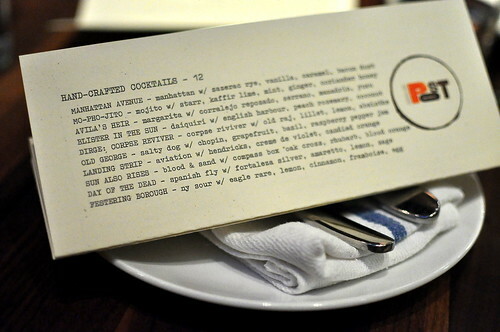 menu is pure genius. and honestly…why do you go to the coolest places?!!?!? Great pictures and great post. It looks like a great new place in the South Bay! I’ve been meaning to try this place! Thanks for the visuals 🙂 amazing photos.